I have been gone every single weekend since the beginning of June. It has been one engagement after another making this an uncharacteristically crazy season. One night last week, I sat next to my hubby on the couch and nervously asked, "Do you feel like we're disconnected? "I didn't think we were, but I wanted to make sure that he was on the same page. "No... I actually feel like this season has brought us closer!" He said. A tentative smile spread across my face as sweet chills ran up my spine. "Really? How so?" After a brief moment, he responded, "I've intentionally poured more into you. And you've been more dependent on me." In two short sentences, he described this season in our marriage perfectly. Digging my heels in to writing my book proposal and wrestling anxiety that has been more intense than usual, I have been dependent on my husband like never before. There was one night this summer where he was out of town for work and his absence was uncomfortable. Oh my goodness. I thought. Without Chris here to break me free from the mind circles within me, or shift my focus from anxiety to laughter, I feel like a hot mess. In that moment, I recognized how very dependent on my husband I have become. That’s how we are supposed to be in marriage; clinging to each other in a helpful, support-each-other-so-well sort of way that the presence is noticeably different in their absence. Reflecting on how much I’ve learned to depend on him in this season was a sweet moment, but it was also a strong reminder of how the Lord wants us to depend on Him. My husband is a trust-worthy, encouraging, loving man; but his goodness cannot even touch the greatness of our heavenly Father who lovingly, tenderly holds us fast even when we don’t recognize it. A metaphor that has been resonating with me lately is thinking about the Lord as our anchor. No matter how crazy the surface gets - storms, 10 foot waves, or a peaceful presence that only a gentle breath of wind can disturb - He grounds us. We cannot and will not flip over, even in a tsunami, because He is not just one of those sissy anchors that looks like your stereotypical sailor tattoo. He’s an anchor the size of the size of a cruise ship – one that looks like a bear trap sunk into the depths of the sea, clawing the earth so deeply that no wind can shift its location. Nothing can loosen His grip on us. No storm, big or small, makes Him any less dependable – He is always there. 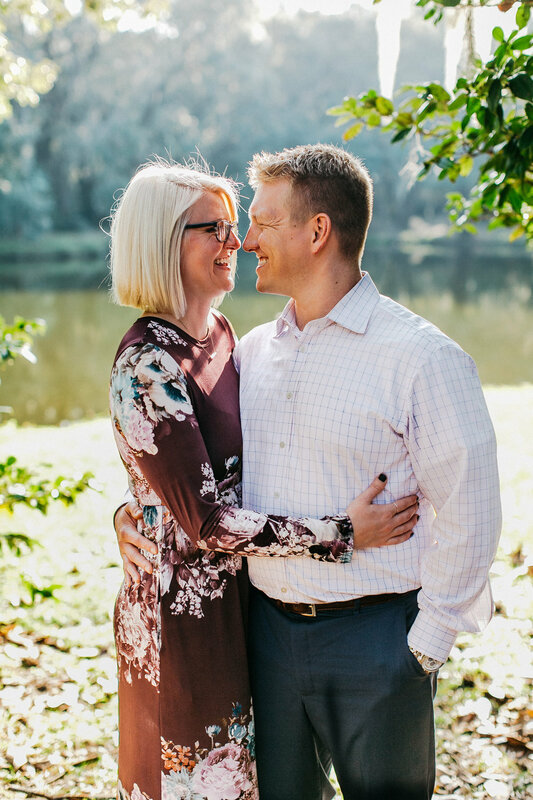 Leaning into Chris in this busy season has been life giving and incredibly beneficial for both of us and our marriage, but even more important than being dependent on my husband is being wholeheartedly dependent on the Lord. Allowing ourselves to depend on someone is not always easy. Our common fear is - What if I lean in to someone and they let me down? Unfortunately this is a reality that we must face with fellow humans, but not with our everlasting Father. He will never, ever let us go. This truth brings comfort to my soul and a steadiness to my anxious heart. My prayer is that it might do the same for you. Together let’s stand on the ledge and trust fall into the steady, capable, dependable arms of our Savior. For the past 2 weeks, every time I went to bed I clicked the button on the side of my phone, raising the volume to the max. Months earlier, my pregnant sister and brother-in-law asked me to support them in labor and delivery as doula and photographer. The plan was to message me when contractions started and I’d meet them at the hospital. I wasn’t going to miss anything if my sister, now rapidly approaching her due date, went into labor in the middle of the night. On April 4th at 3:21 am a loud ding startled me from sleep. Reaching for my phone, it didn’t register until through blurry eyes I read, “Sooooo it’s happening…” My eyes snapped open, and with a large gasp, I smacked Chris across the chest. “Chris!! It’s happening!!! She’s in labor! !” The second text read, “Keep sleeping. I’ll keep you posted.” But there was no way that was happening; this was it! Chris and I prayed together, and I was up and into the shower. Thankfully a few weeks earlier, I made a list for my own hospital bag. Essential oils to diffuse in the room, snacks and drinks to sustain me and my brother-in-law, sweatpants, water, and my camera. Taking a lot of deep breaths, I got myself ready, packed my bag and waited. As soon as I buckled my seatbelt, and breathed with my sister through a contraction, I knew I could do this. I had prepared myself for this moment with lots of prayer, a book called The Birth Partner, and wisdom from a doula friend. With Christ as my rock, I was ready. Little did I know, this was just the beginning of the 35 long hours it would take to bring my niece into the world. The morning progressed quite beautifully. 3 cm, 4.5 cm, to 6 cm – my sister was well on her way and handling each contraction like a rock star. Settled into her beautiful, spacious room at the Aurora Women’s Pavilion birthing center, the mood was light and the energy was positive. She ordered breakfast, laughed, walked, squatted, showered and breathed through contractions. Like a well-oiled machine, my brother-in-law and I took turns squeezing her hips to relieve pain during contractions and resting in between. At 2:00pm, my mom and dad left the room (they were at the hospital the entire time, too) and the nurse was in between rounds. I told my brother-in-law to sleep and planted myself in a comfortable rocking chair. Rocking gently, calming my own nerves and matching the tone of the room, a soft smile rose on my face as tears welled in my eyes. The peace in the room was overwhelming. Tears slipped out my right eye, dampening my cheek as I admired my sweet sister innately, seemingly effortlessly breathing through a contraction while she slept. Here I sat in this monumental moment, this thin place before my niece’s birth - I was overcome. By 6:00 pm, things took a turn. My sister was visibly more uncomfortable and the cervix check informed, no progress. Steady at 6 cm, exhausted and wanting to save energy for the big push, she decided it was time for an epidural. Peace drained out of the room as the anesthesiologist rattled through risks and warning signs. My chest tightened and my stomach lurched; I knew how terrified my sister was in this moment and that this necessary, but unexpected change to our sweetly developed rhythm would be a hurdle. This was a heavy moment for me – having to step out while the procedure took place I felt utterly and completely out of control, which I was. It was ultimately a waiting game now, and inactive waiting in this uncharted territory did not come easy; I was a fish out of water. Now in the guest lounge, I contested sleep until my husband spoke tender words of assurance. “You will get back into your rhythm babe, but right now you need to rest.” 45 minutes later, the largest chunk of sleep I would have that night, I sprang back into action and sent my mom to take her turn to rest. As April 4th became April 5th, progress was slow but steady. Between changing positions to urge baby down and a pitocin drip to get things going, my sister rested and threw up. Yeah… I know, completely unfortunate, although in and of itself it’s a great sign indicating a progression to the final phase of labor. At 3:50 am, 28 hours after her first contraction, my mom and I heard the nurse proclaim the news – she’s complete! I jumped out of the rocking chair, as we looked at each other and cheered silently and clapped without sound. “Time to wake her husband?” I asked the nurse. “Yes, I think so!” she happily exclaimed. It was time for the pushing to begin. Exhausted but eager, my sister began to push. 10-9-8-7-6-5-4-3-2-1 break, 10-9-8-7-6-5-4-3-2-1 and back in again. The nurse warned us that first time mom’s often push for as long as 2-3 hours, but 3 hours later, baby was still happily inside. My sister was exhausted and craving more “epidural juice” and my brother-in-law and I were in survival mode. Wait for a contraction to peak. Hold her legs. Count her through 4 pushes. Cheer her on. Breathe. Step back. Sway (my new favorite way to cope with anxiety). Take a drink of water. Take a quick walk while my mom stepped in for some rounds. Do it all over and over again. With another contraction on the rise, it was decision time. A doctor came in to check baby’s status and we started cheering my sister on. “Show her what you got!” “Let’s push that baby out!” “We don’t need a vacuum – you’re so close!” “You got this!” This exceedingly tense moment was drenched with an abundance of encouragement. My sister’s hospital bed was surrounded – my brother-in-law up by her head, me holding one leg, my mom beside me, 2 midwives, a doctor, and a nurse – and we were all cheering and championing my sister to press this baby into the world. Beside me was a quick shuffle as the doctor cried out– “Oh my goodness! This baby is coming! We don’t have a delivery team ready – get a team ready!” In a rush, nurses and technicians threw on blue gowns, gloves, and hairnets to do all the necessary things to usher this baby into the world. Tension broke and celebration erupted!! “You did it!! She’s here! Good job mama!” Even the midwives wiped tears from their eyes as this strong, boss of a woman, pushed for 6 long hours (the longest they’d ever experienced) to bring the most precious, perfect little girl named Lola into the world. All the stress, anxiety, tension, fear, defeat was rushed away in one massive gush like the blood that now poured out of my sister’s body. No joke, one thing I had not expected was the surge of blood that followed baby Lola out; it was like a bad horror movie. Think Monty Python and the Holy Grail, when they cut the black knight’s arms off and fake blood spurts out. Let’s just say, I now have a memento of my niece’s birth on my shoe. In awe of what my sister’s body had just done, I couldn’t help but look on as the placenta emerged and the cord was cut; everything was finished. I’m so glad the midwife noticed my interest and asked if I wanted to see the placenta, its job now complete. God’s creative mastermind was again reflected in this beautiful organ, often called the tree of life. Google it, it’s gorgeous. My mom and I completely overjoyed, shared some hugs and tears, and looked on as the new mom and dad cried and cooed over their precious little girl. Relinquishing my role as doula, I put on my photographer hat and snapped away. What she didn’t realize was, her affirmation was exactly what I needed after my job was finished and baby girl was here. After all the prayers, all the preparation, all the anxiety, I had done my job and done it well. It was as if the Lord had spoken through the midwives’ sweet affirmation to tell me, “Well done, good and faithful servant.” I was astounded. Praise dripped out of room 2009 in the birthing center – the Lord had been our rock in the heavy moments, our breath when the tension was high, and gave us an epic (I can’t stop using that word) display of the wonder and power of His creation through the birth of His precious daughter, Lola. Childbirth is the craziest, most intense, but earth shatteringly beautiful thing. My sweet sister, I am so proud of you and eternally grateful for this opportunity to stand beside you, and your husband, and witness the birth of your daughter. My life was impacted by this monumental day.